MERRILL – 12 years ago Sergeant Ryan Jopek lost his life while deployed in Iraq. The Merrill community continues to remember its fallen solider, and on Tuesday night people remembered him in a new way at the Sawmill Brewery Company. The brewery’s newest beer is about far more than adding a new flavor. Read the story and view the broadcast at WJFW. 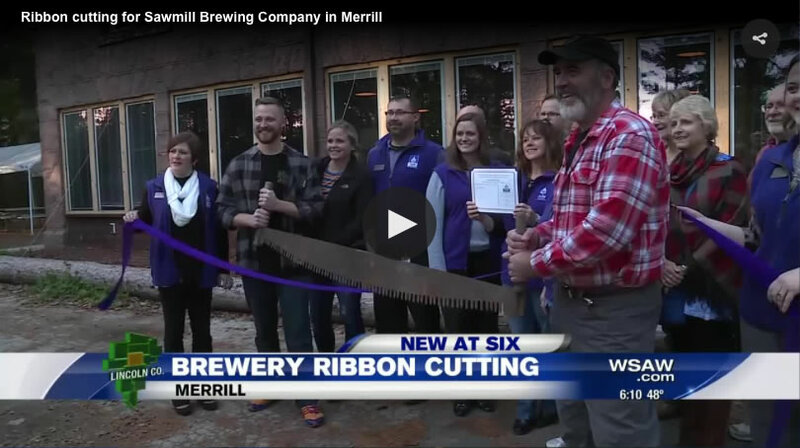 MERRILL, Wis. (WSAW) — The Merrill Chamber of Commerce officially welcomed a new brewing company to the area despite opening earlier this year. Sawmill Brewing Company owner Stan Janowiak said he requested the ceremony be held until they were brewing their own beer, despite opening in March. Read the story and view the broadcast at WSAW. MERRILL, Wis. (WSAW) — Mega breweries led to Wisconsin getting a reputation for beer, but now smaller craft breweries are popping up around the state following a big trend across the country. 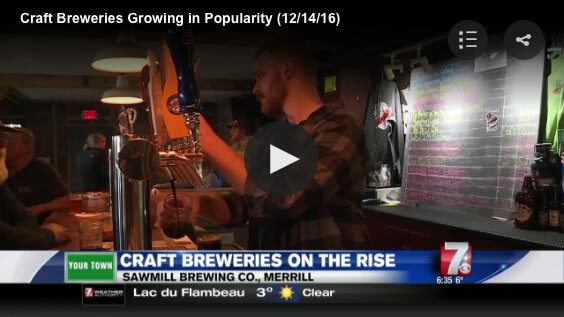 Places like the Sawmill Brewing Company in Your Town Merrill…. MERRILL, Wis. (WSAW) — A business owner in Merrill is finding unique ways to remember the tornado that hit that community in 2011. You can see the broadcast at WSAW. “I think I probably look tired, I sound tired, and I am tired,” said Janowiak. After more than a year of hard work, Janowiak opened up Sawmill Brewing Company Sunday. Uncle Rico is serving up his famous chicken wings out of the Sawmill Food Trailer. These Fresh wings are all the rage and his Amazin’ Glazin’ sauces will keep you coming back week after week. The homemade sauce choices include: Garlic Parmesan, Honey Mustard, Sweet/Spicy Thai, Sweet/Salty Teriyaki, Authentic Buffalo and Honey BBQ. We will be offering open mic nights for anyone who is interested in performing music, comedy or poetry. These will be held every Thursday from 6:30-10pm. Bring your talents to The ‘Mill or watch the talents perform. Either way, enjoy your favorite pint of brew with great company. © 2016 Sawmill Brewing Co.